I gave it my all to try to understand how another performer could be so insensitive and clueless to the power dynamic at play here. As dancers, we are taught to meticulously analyze every point, shape and line on our bodies, trying to figure out what strengths we can play up to distract the eye from any parts that didn't win the genetic lottery. Meanwhile, we're constantly comparing our looks and abilities to those of other bodies around us every single day. To tell Grant that she has the talent, but can only get a job if she eventually "sorts out" her body is cruel and shallow. To slam a fellow performer for speaking out about the scrutiny and discrimination we all face on a daily basis is unforgivable. These actions are not only hideous examples of body shaming. Something much sinister, they aim to attack one's value, worth and freedom of expression. They make a statement that only some bodies are worthy of our gaze. Sometimes the most interesting bodies are those that do not fit society's mold, physically or cerebrally. It is precisely those bodies that lead me to ask the following questions: Who gets to perform on a stage? Why is there one aesthetic ideal in the dance industry? 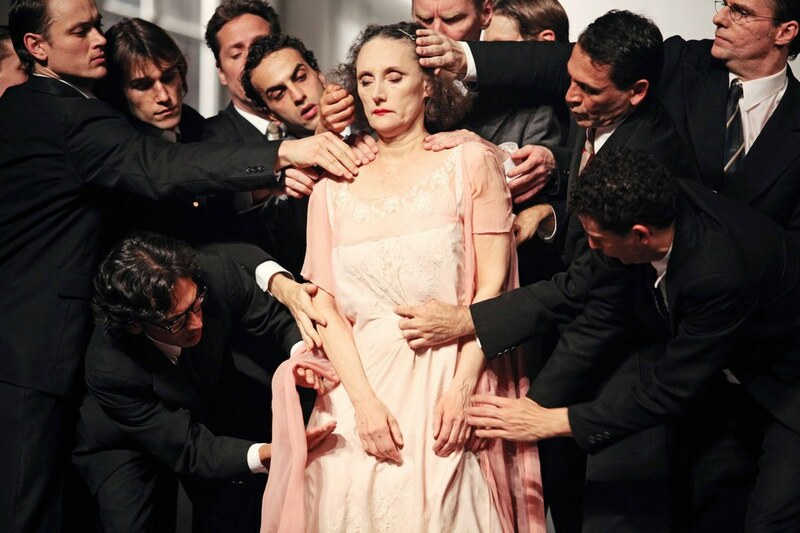 Do I need to wait for the Pina Bausch company to come back to New York to witness dancers in their 50s and 60s on stage? Do I always need to go below 14th street to find performers that do not "look good" in hot pants on stage? How does looking good in hot pants on stage effectively enhance a production anyway? Nazareth Panadero and Tanztheater Wuppertal in Pina Bausch's Kontakthof. Photo by Julieta Cervantes, courtesy Brooklyn Academy of Music. Some of my most inspiring colleagues are dancers who surprised me with the creative ways they work with the bodies they have. If someone older, younger, heavier, smaller, less experienced than you has learned to do something new, how can you think you've reached your body's limitations of expression? We cannot help some of the power dynamics we are subjected to on a daily basis. But let's remind ourselves next time in class, rehearsal or auditions that one body is not inherently better than another just because of its type. The same movement does not automatically look better on a skinnier dancer. Every time you think someone would dance better if they lost weight, ask yourself if it's that's really what you think and not a result of seeing the same body type repeatedly portrayed as "a dancer's body" on stage and screen over and over again. We are lost if we cannot see the effort, vulnerability and significance in each others' hard physical work. We have to offer each other support and advocacy in a way that our superiors can't or don't want to. And as for the audience, representation on stage carries its own impact. I have had the privilege of performing with many brilliant female dancers who would be considered too large for our industry, and yet, every show there would be a handful of audience members so glad "to have seen someone normal shining on stage for a change." And at the end of the day, there should be no such thing as a normal or not normal performing body. We are all bodies that move, which is already significant.